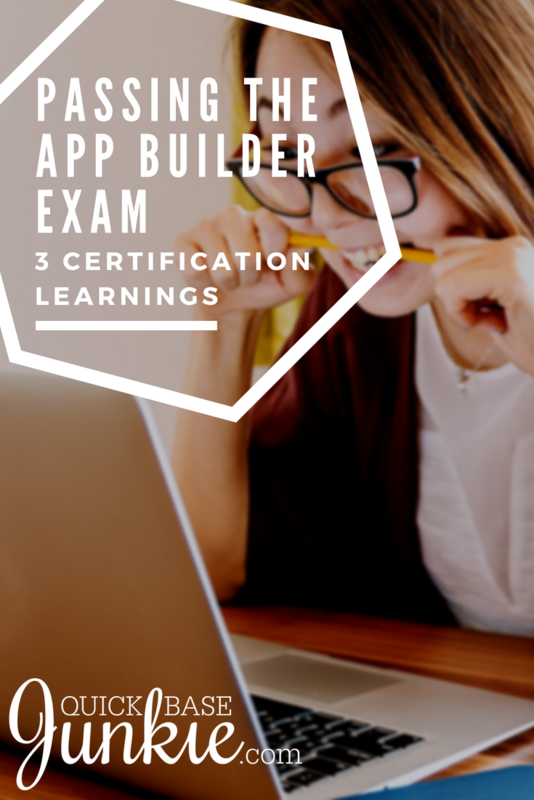 I had initially planned to take the combined App Builder and Expert Builder exams using the free code provided by Quick Base (thank you Quick Base ♥). Then I thought better of the idea, having not memorized the API guide or implemented a great many webhooks (yet!). So, I dove into preparing to take the App Builder exam. For those of you who might be wondering what the Quick Base Certification is all about, below is some information from the Quick Base University along with some of what I learned from asking QuickBase support. This year Quick Base started offering two different certifications. The App Builder Certification: A 1-hour, 60-question exam for intermediate builders who can build apps for themselves and roll-out apps to end users. The Expert Builder Certification: A 1-hour, 60-question exam for advanced builders capable of building apps and training others on how to maintain those apps. You need an App Builder Certification to qualify for this exam. You can either take the exams separately or as one exam together. If you take the exams together, the questions are intermingled, and even if you 'pass' the questions from one exam and not the other, you will not get the certification for that portion of the exam. However, you could still pass the overall exam if the combined scores meet the minimum scoring requirement of 70%. It's an all or nothing sort of deal. 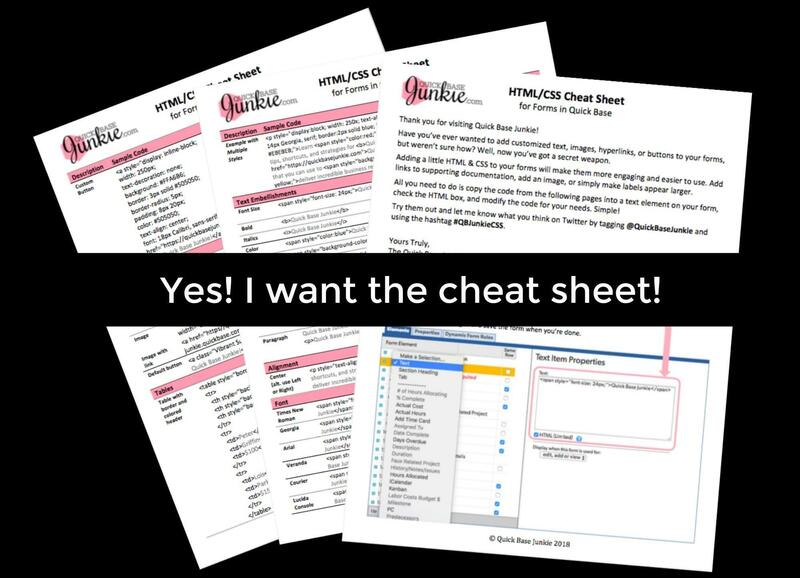 Since I've only taken the App Builder exam, I only include its details in this post. UPDATE: I've passed the Expert Builder Exam! Get my prep tips and shortcuts. If you're not interested in (or already know) the details, feel free to scroll down for my 3 certification learnings. The exam isn't nicely broken down into topics, but Quick Base has provided a list of topics that the exam questions are pulled from. If you're not so familiar with any of these topics, be sure to spend some time brushing up on them (see learning #1 below). If you found this blog post helpful subscribe to receive more Quick Base info! Phew, that's a lot of topics! If you're still with me, I would love to share some of my learnings from taking this exam. One: Prepare for the exam. Prepare even if you have been building apps for a long time. Maybe especially, if you've been building apps for a long time. I only reviewed a few of the courses that Quick Base offers in their online university. The Best Practices course and the Intermediate course. And to be perfectly honest I skipped ahead during the boring or repetitive parts. I found many of the exam questions weren't so much related to applying the skills a builder needs, but to knowing the limitations, requirements, or nuances of a particular feature. Think of it as "book smarts" vs. "street smarts." Two: There is a mix of long and short questions. Don't get too worried about spending a little time on the longer questions. I was able to do a first pass of the exam in about 35 mins. 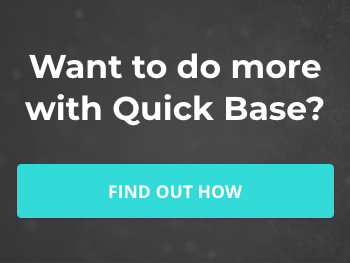 Quick Base allows you to flag questions. So I was able to mark questions I wanted to revisit for a second look before submitting them. There were both Multiple Choice and Multiple Select type questions. A nice feature was that the Multiple Select questions indicated the number of items you need to select. This was something that tripped me up on the course assessments, so I appreciated it in the exam itself. Three: Take the time to draw out any diagrams. It's true what they say that a picture is worth a thousand words! Having a visual image might help with complex role and relationship type questions. With the additional 25 minutes I had, I drew out several diagrams on scratch paper to assist me in answering a few questions. Also, don't worry about submitting the exam before the timer runs out. It will automatically submit for you when the clock reaches 00:00. With experience and a little preparation, the exam should be a breeze. Once certified, Quick Base provides you with a downloadable PDF of your certification, a clickable certification for your LinkedIn profile, and depending on your account, your company may also be notified and award you badges. Now that's cool! For more information visit the Certification Page on the Quick Base University site.